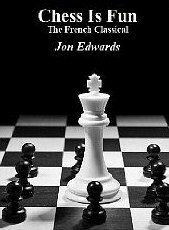 The 10th U.S. correspondence chess champion Jon Edwards has authored a series of 20 "Chess is Fun" e-books, all available for the Kindle and the Nook, at just $2.99 or less. The e-books are advertised as "a better, less expensive way to learn" with "solid instruction, critical lines, fresh ideas, annotations move by move, complete games. The plentiful use of diagrams make these among the first chess books that you can read without a board to help." Last night, I drew this game in a tournament at the Marshall Chess Club. 51.Qa8+ Kd7 52.Qb7+ Ke6 53.Qa6+ Kf5 54.Qd3+ Kxe5 55.Qe3+ Kd6 56.Qf4+ Kc5 57.Qxg3 Rc2 58.Qxf3 Nd5 59.Qf8+ Kd4 60.Qg7+ Kc5 61.Qf8+ Kd4 62.Qg7+, draw. Alejandro Melchor gives this move a ?! while saying 5.Bb3 merits a !. I disagree, as both moves can be handled over the board against human players. 16.Nc5 Bxc2 17.N3e4+ Kg6 18.Rd2 Bxe4 19.Nxe4 Rge8 20.f3 Rxe4 21.fxe4 Nf3+ 22.gxf3 Rxd2 23.Rc1 Rxb2 24.Rxc6+ Kg5, draw. To begin with, the tournament started late because the room was being used for another function. This was reflected in the subtraction of some time off the clock for both players. 1.e4 e5 2.Nf3 d6 3.d4 f5 4.Bc4 b5 5.Bxg8 Rxg8 6.dxe5 dxe5 7 Qe2!? Now my opponent decided to get his king to safety and bring the heavy artillery into play. 9.Rd1 b4 10.Qe3 Qe7 11.Qb3 Qf7 12.Qa4+ Qd7 13.Qb3 Qf7, draw. 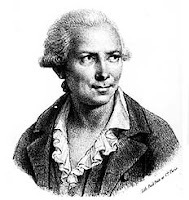 At Contre Gambit Philidor, Frederic Fournier analyzes my recent games as Black against Ed Kopiecki and Nicole Zlotchevsky. Thank you all so much for supporting Brooklyn Castle! We reached our goal yesterday afternoon just in time for our 11pm deadline. The last 60 days have been exciting, suspenseful, surprising, and insightful -- pretty much an encapsulated version of the last 3 years of making this movie! 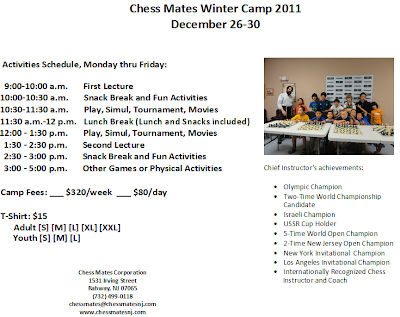 The climax came yesterday morning when we received an e-mail from Elliott Neff who runs Chess4Life. He was so moved by the project that he and his brother Raphael, owner of The Chess House, pledged $5,000, taking us over the finish line just in time. Elliott and Raphael have a passion and love for chess and believe deeply in the potential chess has to change kids' lives. We look forward to working with Elliott and Raphael on partnership ideas for our screening campaign. We also just received an inquiry e-mail from a board member of Change for Kids, a non-profit organization that "believes every student deserves a quality education, and every school needs the proper resources to deliver it." Change for Kids also wants to talk to us about ways we might be able to work together -- another great potential education partner for our campaign. A film's fundraising campaign is, of course, about raising the money; but it's also about something just as important -- reaching out to all of you and building our audience, finding new partners, and discovering how Brooklyn Castle can have an impact out in the world. Tomorrow we head back into the edit to put the finishing touches on our Tribeca Film Festival submission, and we are energized and inspired to get to work finishing the best movie possible. Thanks, you guys!! We will keep you posted on our progress over the next few months. And please keep in touch with us at info@brooklyncastle.com. On Sunday, I finished with a score of 2-0-2 in a game/45 Swiss at the Marshall Chess Club. 33.Re2 Ke6 34.Rxe4 dxe4 35.Ke2 Kf5 36.Ke3 h5 37.g3 Ke6 38.h4 Kf5 39.Bc5 g5 40.hxg5 fxg5 41.Be7 Bb7 42.a3 Bc6 43.Bd8 Bb7 44.Be7 Bc6 45.Bd8 Bb7, draw. 28.Nxd3 exd3 29.Kf2 d2 30.g3 d1=Q 31.Rxd1 Bxd1 32.Ke1 Bg4 33.Kd2 Kd7 34.Kd3 Kd6 35.Kd4 Bf5 36.a3 a6 37.a4 Bc2 38.a5 Bf5 39.Kc3 Ke5 40.Kd2, White forfeits. 11.Bxf6 gxf6 12.Nc3 Be6 13.Bxe6 Nxe6 14.Ne2 O-O-O 15.Rad1 Ng5 16.Qg4+ Qe6 17.Qxe6+ fxe6 18.f3 Rxd1, draw. 47.h4 h5 48.g3 Ke6 49.Ke3 d5 50.Kd3 dxe4+ 51.Kxe4 Kd6 52.Kd3 Kd5 53.Ke3 e4 54.Ke2 Kd4 55.Kd2 e3+ 56.Ke2 Ke4, White resigns. 12.Rhe1 Bxc4 13.Nxc4 Bb4 14.Bxf6 gxf6 15.Rxe4 Bxc3 16.bxc3 Nc6 17.Re3 Rad8 18.Red3 Rde8 19.Rg3+ Kf7 20.Ne3 Rd8 21.Rd3 Ne7 22.Rh3 Kg7 23.Rg3+ Kf7 24.Rh3 Kg7 25.Rg3+ Kf7 26.Rh3, draw. 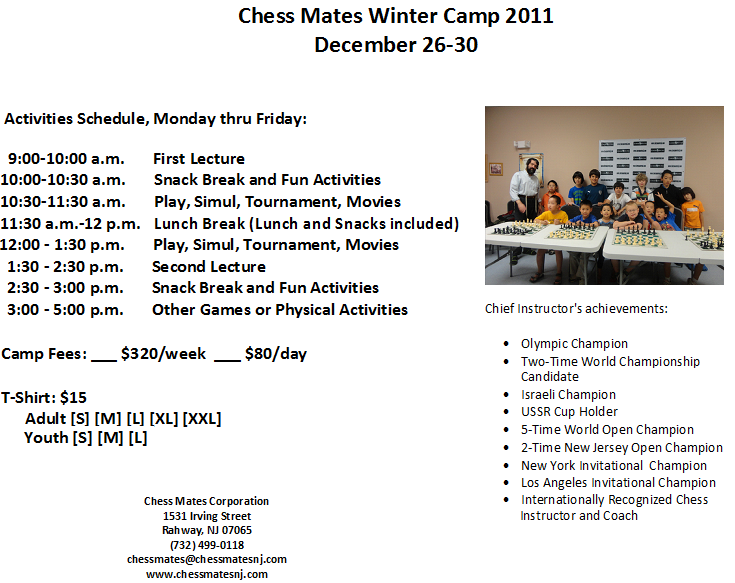 Next week, Chess Mates in Rahway will be holding a winter camp. The chief instructor is grandmaster Leonid Yudasin. Fridays, at Briarwood School in Florham Park. Yesterday I received this e-mail from Brooklyn Castle. As the year winds down, so does our Kickstarter fundraising campaign. We have until 11:08pm EST on Monday, December 26th, to reach our goal of $20,000. If we don't reach $20k by then, sadly, we don’t get to keep any of the pledges that have already been made. That's the way Kickstarter works – it's all or nothing, and we are currently at $12,256. Please, if you can, help us get over the finish line by making a pledge today. 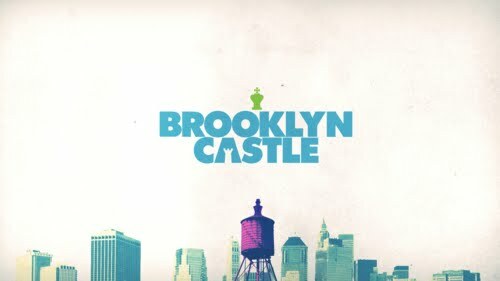 Visit: http://www.kickstarter.com/projects/rescuedmedia/finishing-brooklyn-castle-formerly-chess-movie. Google + I.S. 318 Chess Team + Brooklyn Castle = Unbeatable Field Trip. The I.S. 318 chess team went head to head with Google's own chess brainiacs on December 2nd and left with a 45-9 win. “It just reinforced our belief that our kids are the intellectual equals of anyone. They’re proud of what they’ve accomplished and they’re proud to show it off.” - John Galvin, chess coach. (more from the NY Times SchoolBook article here). (Don't forget to click the "like" button!). On Saturday, I took these pictures at the Hamilton quads. <>The chess novel Los Voraces 2019, by grandmaster Andy Soltis, is reviewed in The Boston Globe. A couple of months ago, I started giving chess lessons to seven-year-old Vrithik Umapathy [pictured, playing Black against Gary Sheaf]. At the time, Vrithik was rated below 900. Already Vrithik's unofficial rating has climbed above 1300. On Saturday, he won the following game at the quads in Hamilton. 27.Rf1 Qh4 28.Bf2 Qg5 29.Qe3 Nf4 30.Bg3 Nh3+, White resigns. Yesterday I drew all three games at the Hamilton quads. These two were nearly losses. 32.Rd8 Re2 33.Rd7+ Kf6 34.Rxa7 Rxf2 35.Rb7 f4 36.gxf4 Rxf4 37.Rxb6+ Kf5 38.a4 Rxh4 39.a5 Rxd4 40.b3 Re4 41.a6 Re8 42.b4 h4 43.Rb7 h3 44.b5 h2 45.Rh7 Rb8 46.Rxh2 Rxb5+ 47.Rb2 Ra5 48.Ra2 Rb5+ 49.Rb2 Ra5 50.Ra2, draw. 79.Kb3 Nf4 80.Kc2 Kg4 81.Kd2 Kf3 82.Ba7 Ng6 83.Bb6 Ne5 84.Ba7 Ng4 85.Bg1 Nf2 86.Ke1 Nd3+ 87.Kd2 Nf4 88.Ba7 Kg3 89.Be3 Nd5 90.Ba7 Kf3 91.Bc5 Nf6 92.Ba7, draw. 14...g5 @ "Contre Gambit Philidor"